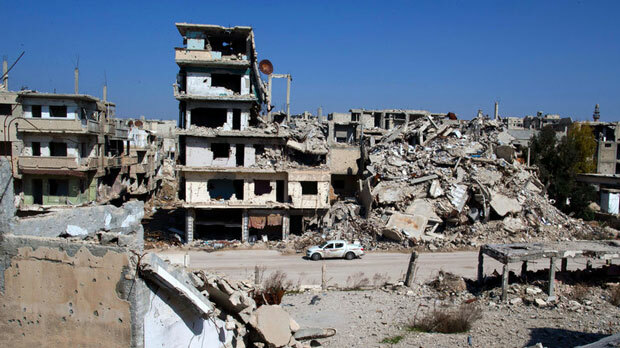 A car drives through a devastated part of the old city of Homs, Syria, on Friday. Syria&apos;s cessation of hostilities is largely holding on its third day, even as the main opposition umbrella group accuses the Syrian regime of violations. "Right from the onset of the truce, a large number of violations have been committed by the regime and its allies in several parts of Syria. The regime has continued to target populated areas using helicopter raids to using explosive barrels, resulting in a large number of fatalities and causing significant injuries, most of whom were innocent women and children." Hijab said the opposition&apos;s main umbrella group recorded breaches of the agreement in 26 different areas of Syria. U.N. Special Envoy for Syria Staffan de Mistura told Morning Edition that "every time there has been an incident, that has been — so far — contained." He did not specify how many incidents have been reported. "That would be a major booster in confidence-building and trust. Let&apos;s not forget, 5 years of horror. 300,000 people killed. 1 million wounded. There is total distrust from the sides. And the first gesture of believing in each other, or at least believing that there is a nonmilitary solution, is the reduction of violence." As we have reported, the cessation is aimed at jump-starting peace talks among the warring parties, which the U.N. plans to hold starting March 7. The truce does not include groups classified as terrorists by the U.N. Security Council, such as ISIS and the al-Qaida-linked militant group Jabhat al-Nusra. Fighting continued Monday in parts of northern Syria, where Syrian state mediareported that the Syrian army and allied fighters wrested control of a road in Aleppo province from ISIS militants. A major issue here is that Russia&apos;s military, which is aligned with the Syrian regime, has repeatedly said it is hitting "terrorist" targets even though moderate rebel forces claim they&apos;re the ones being targeted. Now the main opposition group is accusing the Russian military of doing just that — again. Hijab said in the letter that on Sunday, "Russian fighter jets launched twenty-six air strikes against territory held by opposition groups which have announced and entered into the truce." Syria&apos;s opposition is hoping that this cessation of hostilities will be a chance to deliver badly needed humanitarian aid to hard to reach areas. A tweet from the U.N.&apos;s humanitarian arm showed aid vehicles entering the besieged town of Moadimiyet. "Fifty-one trucks are carrying domestic supplies such as blankets, soap and diapers" into Moadimiyet, Muhannad al-Assadi, a spokesperson for the Syrian Arab Red Crescent, told The Associated Press. The besieged rebel-held area is a suburb of Syria&apos;s capital Damascus. NPR&apos;s Alison Meuse tells our Newscast unit that "the U.N. says it hopes to reach more than 150,000 people in besieged areas this week." Also Monday, the World Food Programme said it has raised enough funds to fully reinstate its food assistance operations to Syria. The U.N. aid group said this comes after a record-breaking pledge drive at a conference earlier this month, where it raised about $675 million.